“Sucker Punch film poster” by Source. Licensed under Fair use via Wikipedia. An action fantasy that takes us into the vivid imagination of a young girl whose dream world provides the ultimate escape from the darker reality. Unrestrained by the boundaries of time and place, she is free to go where her mind takes her, and her incredible adventures blur the lines between what’s real and what is imaginary. She has been locked away against her will, but Babydoll (Emily Browning) has not lost her will to survive even in a mental institution. Determined to fight for her freedom, she urges four other young girls-the reluctant Sweet Pea (Abbie Cornish), the outspoken Rocket (Jena Malone), the street-smart Blondie (Vanessa Hudgens) and the fiercely loyal Amber (Jamie Chung)-to band together and try to escape a terrible fate at the hands of their captors, Blue (Oscar Isaac) and Madam Gorski (Carla Gugino), before the mysterious High Roller (Jon Hamm) comes for Babydoll to lobotomize her. Led by Babydoll, the girls engage in fantastical warfare against everything from samurais to serpents, with a virtual arsenal at their disposal. Together, they must decide what they are willing to sacrifice in order to stay alive. But with the help of a Wise Man (Scott Glenn), their unbelievable journey-if they succeed-will set them free. It seems to me Zack Snyder thinks that the movie concept similar to a Russian nesting doll is enough to excuse its hollow center. Well, it isn’t. Gun-toting hotties in micro skirts, knee-high stockings and blouses with extra low necklines have always been one of the favourites movie industry’s eye candies but I don’t think it should be the only asset of a movie which is supposed to deal with something far more serious – like mental illnesses of teenagers, escapism and abuse of minors. I was offered a kind of a popcorn flick, accidentally set in a private mental asylum which after hours was turning into an exclusive brothel, catering to fat cats and politicians. Ha ha, so very funny. NOT. Despite the filmmaker’s attempt at an overarching story of female self-empowerment Sucker Punch is one of the most formulaic films I’ve watched so far, establishing the role of a female lead as just an eye candy. The plot is almost non-existent as the entire story consists of five girls making an attempt to get out of the maximum security asylum. ‘To do what’, you can ask. A good question but there is no answer to it – even the girls don’t plan further than to ‘get out of there’. Anyway Babydoll (Emily Browning) must find and steal five symbolic but also real items – the majority of which are tied to one of the film’s fantasy set-pieces. Similarly, the premise/vehicle through which Babydoll repeatedly enters the dream world isn’t nearly as artistic as Snyder must have thought – and, with each successive performance, becomes increasingly awkward. You see, she is supposed to dance erotically to a piece of music but we don’t see one single choreographic movement of her body. I do wonder why. Still one of Sucker Punch’s deepest flaws is a lack of stability. There’s never a chance for the audience to form more than perfunctory bond with the characters, it jumps from one scene to another without any cohesion. In the end, the film seems to violate the most basic storytelling principle concerning any kind of fiction – show, don’t tell. Throughout the movie, the audience is told, just told, that each victory results in some significant impact on each character’s sense of self-worth – but the story never takes advantage of the promised momentum. Even in the closing moments of Sucker Punch, I really wasn’t sure whether anyone has actually been empowered – in spite of voice-over narration that preached otherwise. Apart from that the characters were really cardboard cut-out flat. It seemed to me their outfits and makeup were far more elaborate than their personalities. If I had to compare this movie to food I would say it is one of these overly sweet McDonald’s shakes I hate. It promises you a real strawberry flavour and plenty of slurping fun but after two sips you find it very difficult to finish and eventually all the cup lands in the bin not even half empty. Now I have one question: how such a weak script has been given the green light and funds? Just because of provocatively dressed teens? 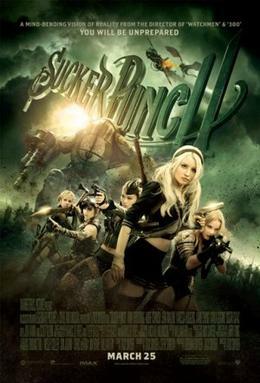 This entry was posted in fantasy action movie, movie review and tagged a total failure, movie review, sucker punch, zack snyder. Bookmark the permalink. Bummer and this actually sounded good. However, I had my doubts. Why in action films, anime, and so forth does the girl (s) have to be damn near nakey and hotter then heck? Because the director caters for a very specific audience? Well that sounds like a hot mess. Give me Battle Royale over this any day. Battle Royale had far much style imvho.